An adorable accessory for the Baby Spring Float. 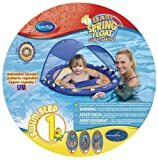 Three-position adjustable, removable canopy protects baby from the sun and folds for storage just like the Baby Spring Float. Features an adorable "rainy day ducky" design and includes a carry/storage bag. 34"L x 30"W x 3"H. 1.64 lbs. Ages 9 to 24 months. Mesh playspace for toys and splashing. Dual inflation chambers and low seat for enhanced security. Carry and storage bag included. Three-position, adjustable and removable canopy folds for storage. Adorable rainy day ducky pattern. I agree with everyone else... its fantastic! I bought this when my little guy was 6 months old, but finally had a chance to use it last weekend. He's now 9 months and seems perfectly secure - and undeniably very comfortable - in it. He's been using it every day since and we love it! We can splash around a bit with our older child, while he feels like part of the fun, but has his own space and doesn't need to be held. My only worry is that he'll fall asleep in it (he often seems so chill in it, it appears he's about to doze off - and he's not the dozing off type) and then maybe flop forward. Not too big of a concern - obviously we closely watch him while he's in it. But we're amazed at how relaxed he is in it. And it looks like it will fit for a while. Not up to age 5 though, which is the age of our older child who thinks it's so cool she wants to be in it. We recently bought the Float with the Sun Canopy. We had been using a different Swimways Float without a Canopy for 2 months and the Swimways Floats are just great. We needed the Canopy for the Sun protection. The Baby is 6 months old now & weighs 16 lbs. The Canopy is PERFECT. The Canopy has 6 snap clips to attach to the Float. The Canopy is stable. It maintains its position overhead or it will "snap" in the titled position. Excellent sun protection for the baby that won't keep her hat on. The Float inflates and assembles Quickly in just 2 minutes. You need to pinch the air valve with your teeth or fingers in order to open the valve flap while blowing up the rings. Some people do have an issue inflating these toys with the one-way Valve (with the internal Flap to trap the air from escaping). It is hard to inflate/deflate if you do not pinch the valve. The Float deflates and folds nicely into the small carry pouch. 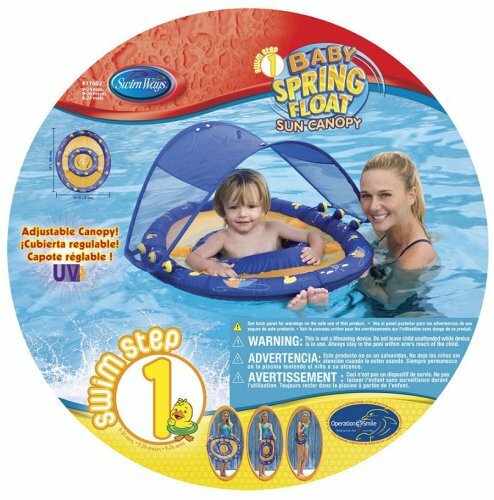 The Float allows baby to support and stabilize herself with her arms on the top side of the inflatable inner ring. The Float works great! It supports her well and she can still splash in the mesh area on top of the float. She feels comfortable in it. She moves her legs, kicks, splashes with her hands, and has Fun. The Float is Very Stable. Educational? Well, we have been teaching her to swim and the kicking exercises are simple when she is in the Float. She is supported by the float and we can move her legs and encourage her to kick. A great first float for infants and toddlers. As a mom of five water babies, I've used a few of these in the past. This is by far the best. I love that the inner and outer rings are connected with mesh material. This way the baby can actually play in the water! Most other floats it seems the baby's legs are dangling in the water while the top half is distracted by a lot of plastic distractions up top. (isn't the point of taking a baby in the pool to let them experience the water?) With this design my daughter can sit right in the water and play with her duckies and water-proof books while splashing at the water all around her. She absolutely loves this seat! Usually I take her in the water and swim her around for a while to get out a lot of her excited excess energy, then once she's calmed down a bit she relaxes in her seat floating around near me. The included canopy attaches and detaches easily and we love how adjustable it is. I would definitely recommend this.